The artistic opportunities made available by the popularization of DVD technology seem all but unexplored by a market driven by the repackaging of old product. That is untill now. 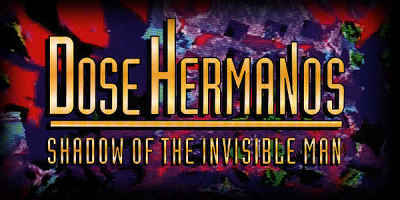 Dose Hermanos, the worlds foremost psychedelic keyboard duo, have just released "Shadow of the Invisible Man", their first "Audio/Video Album" created especially for the DVD format. A product which has at it's creative core the possibilities made available by new technology. "Dose Hermanos release first DVD "Album"
Using a new system of virtual mapping, Dose Hermanos is attaching sounds and images to the notes of their keyboards in real time. This "digital fingerpainting" as they call it allows you to see every note that they play including harmony. Or seen from a different angle they are performing movies live. All the music on the DVD is improvised by these two keyboard masters (both of them symphonic composers who crossed paths while working with the Grateful Dead) who play you through synthesizers and lunar landscapes (Alien's Alley) to symphonic tone poems and impressionistic paintings (Seduction of the Demons). Each piece portraying music in a different way. Weaving their musical stories through the bluesy soft colors of the title track to the hard edged visual dance of the rock influenced "Urban Scrawl", they maximize the dramatic use of the 5.1 surround sound reaching musical, visual and sonic climaxes which are breathtaking and at times even humorous. Rythmic patterns fall into natural visual grooves which seem as driven by sight as they are by sound. "This is the dawn of a new art form" says Dose Hermano Bob Bralove, "where we are not matching pictures and music but picture is music and music is picture. Music itself has always been the invisible man and as this art form takes birth Dose Hermanos has been lucky enough to find a way to record the first shadows of that man coming to light." Produced by Bob Bralove, Associate Producer Hank Putek.